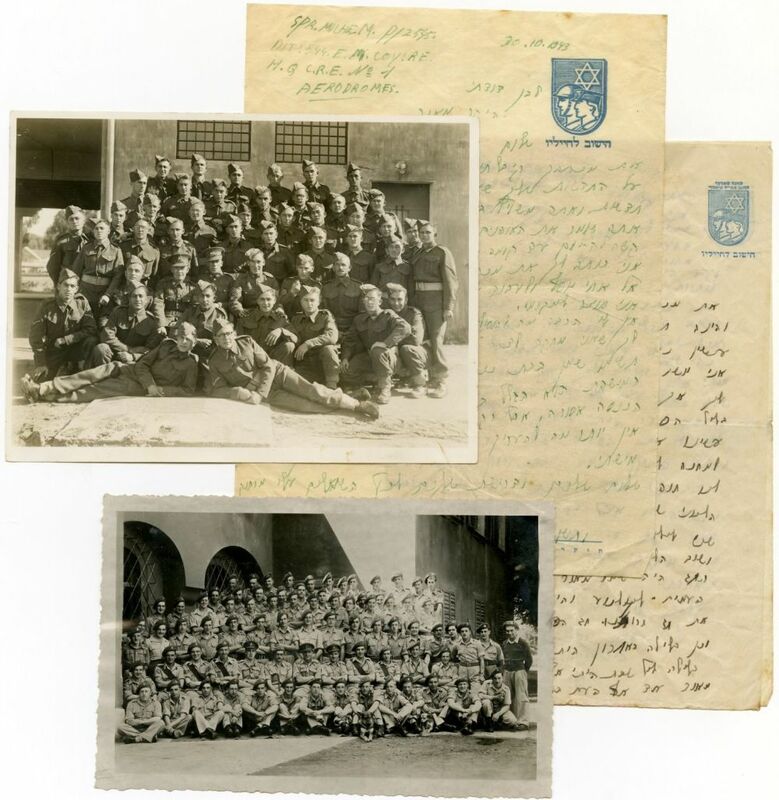 Interesting collection with 36 letters and 19 photos of soldiers in the Jewish Brigade, Italy and other locations - 1942-1944. * Photos include: group pictures of soldiers in the brigade, a number of photos of a soldier with his fiancée, photos of Jewish soldiers in the streets of various European cities and more. * Various letters written in different places by soldiers of the Brigade in 1942-1944, some on stationery with the emblem of the Jewish Brigade. The letters describe the atmosphere of the daily life of these Jewish soldiers, their relationship with their Italian and British comrades, and letters expressing concern for their relatives in foreign lands, descriptions of their everyday life, letters discussing arguments between the soldiers and more. One of the letters describes a Pesach seder: "We gathered together all the soldiers in the area, about 600 Jewish soldiers from all over, and the military rabbi read the entire haggadah, and we drank wine and ate matzot, and it was very merry ..." Another soldier relates that there was a lack of fruit on T"U B'Shevat: "On T"U BiShevat, we didn't feel the holiday at all, I didn't even eat anything special for the holiday, there are plenty of oranges, but at a price that you cannot buy them ... five Italian pounds ..." Another writer describes spending time with soldiers at the "Jewish Soldier Club": "This week they opened a new club for Jewish soldiers in the area, and I am writing this letter in our club." Another letter notes, "First the good, that we have a club named "HaChayal HaYehudi," second, we have a ping pong table ... a radio, a reading room, old newspapers from the Holy Land ... and all different soldiers from all corners of the world ... come here, who are in the British army..." In another letter, the writer describes his longing for the Land of Israel: "I haven't had vacation for the two-and-a-half years that I am in the army ... I hope that victory is approaching and that we will be free in our Land forever ..." Letters with New Year's greetings: "A year of victory, redemption and that in the new year we will destroy the forces of our enemy forever ..." Emotional thoughts about the end of their military service: "In another six days, on 6/12/44, I finish three years of wearing an army uniform in the British army ..." and more. Varying sizes and conditions. Other than stains in some of the letters, overall fine condition.